Not all startups and small entrepreneurs have enough money to be spent on advertising these days. However, those who do have reasonable funds to invest should carefully think about what to write on their banner ads, to make sure that the ads achieve high CTR (Click Through Rate), and from people who genuinely are interested in discovering more. Follow can help you do that. 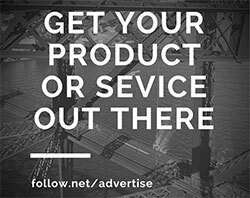 At Follow we make it easy to see what your competitors do on different verticals, such as traffic, affiliate, demographics, social media, who-is information, contextual advertising, etc. 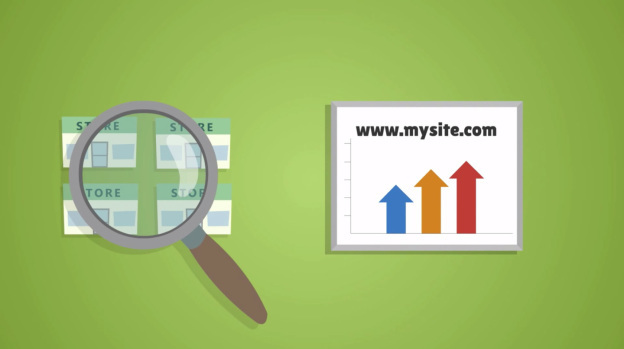 What we also provide, however, is data on display and contextual advertising. In display advertising, we give you access to text ads, but, most importantly — for the sake of this article — we give you interesting data on banner ads. 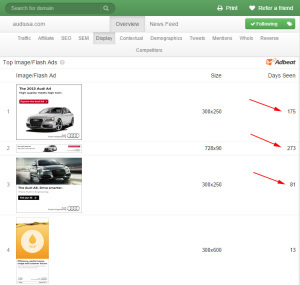 You can, more precisely, see the banner ads your competitors are using. 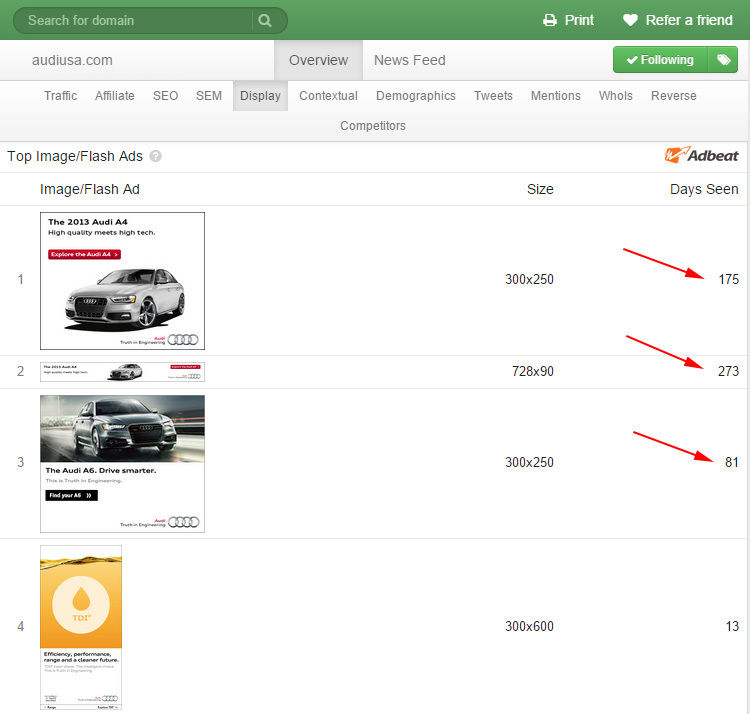 Looking at your competitors’ long-lasting ads is important, for you may see what the most profitable ads look like. Doing that will allow you to build better display ads to promote your business, and, of course, gather more business leads. What we wanted to do here, is analyze some of the banner ads by a few great brands, to see whether it’s possible to identify a common denominator for success. Below here you may see a percentage summary of what we found out. Do the ads have a specific offer in the title? 62.50% do. Do the ads mention a benefit? 62.50% do. Do the ads mention a feature? 50.00% do. Do the ads include a specific CTA (Call to Action), clear enough that makes a reader understand what happens after clicking? 87.50% do. Do the ads include the company logo? 100.00% do. Do the ads have a teaser, supporting message for emphasis? 75.00% do. Nevertheless, today we will focus only on those banners by Adbeat. We will do that because, within Follow, we need to look at Days Seen. This piece of data is under Display > Top Image/Flash Ads. Days Seen shows you the longest-running image and flash ads a given company has been using on display. The longer an advertisement has been running, the more profitable the ad most likely is. Let’s now start by taking a look at the ads with the highest Days Seen. NOTE: It’s important to mention, before we commence, that all banner ads included in this column were screenshot during the week of October 13-19, when the article was written. The banner ads may not be running anymore by the time you read this article. Moreover, we are going to analyze only those ads running for a period greater or equal to 30 days. Lastly, all following images may be clicked to be enlarged. Amazon and eBay operate in the e-commerce industry. Let’s see what they do with their advertisements. 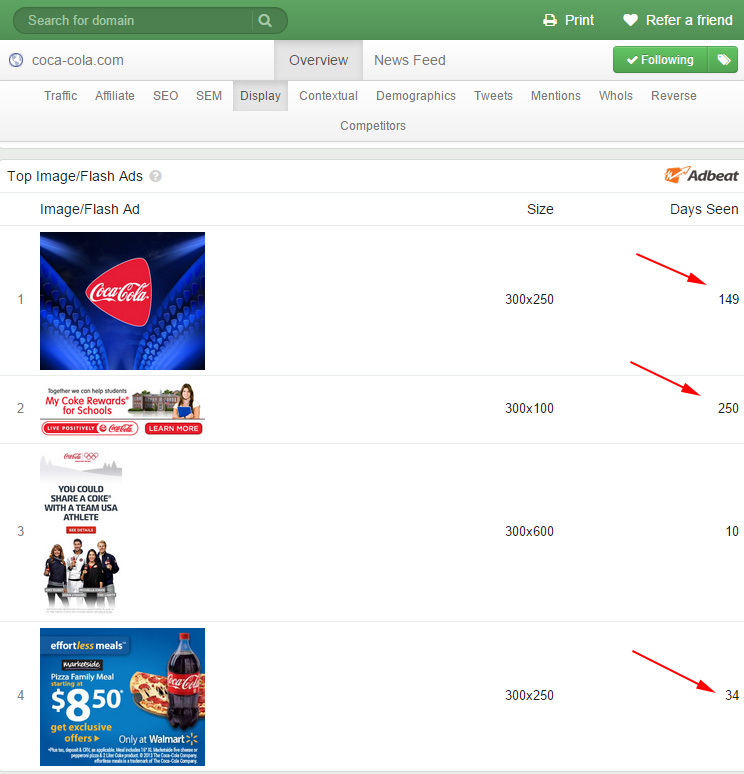 These below are the Top Image/Flash Ads on desktop computers. 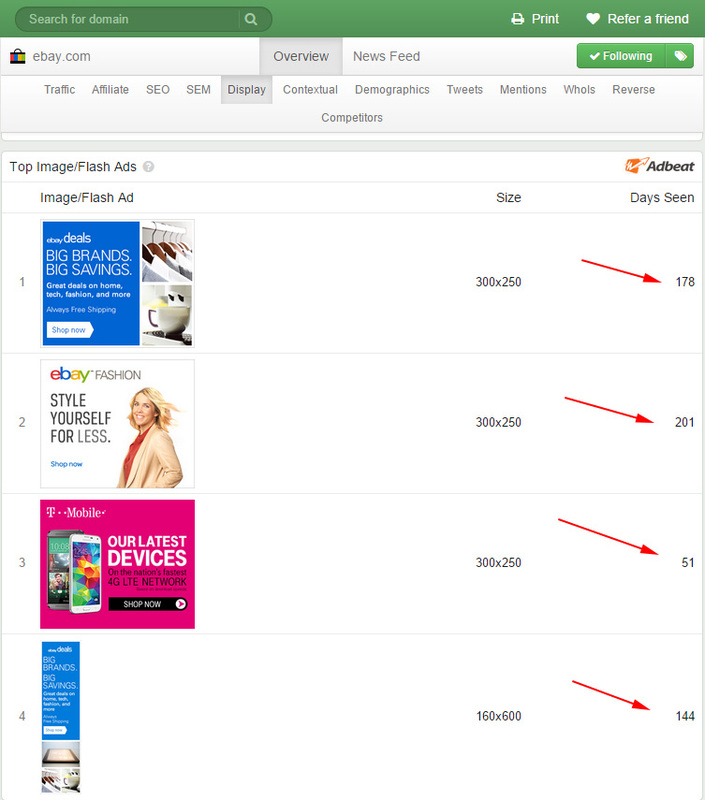 Follow also provides Top Mobile Image/Flash Ads for mobile devices, but, on this article, we will only focus on desktop ads: Amazon (left), and eBay (right). 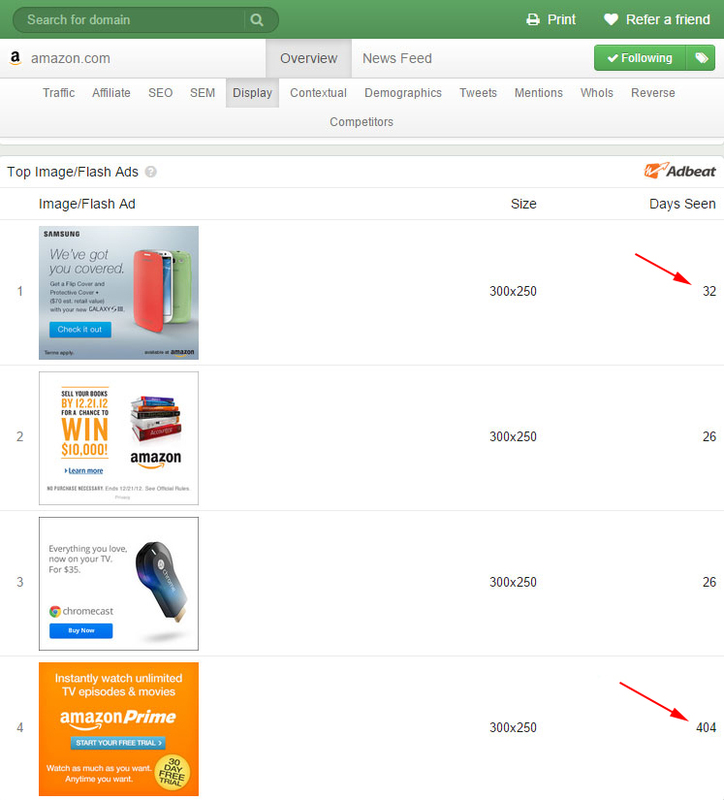 Top Image/Flash Ads for Amazon.com on desktop computers. The red arrows point to ‘Days Seen’ figures that are greater than 30 days. Remember, the highest ‘Days Seen’, the more successful the ad most likely is. Top Image/Flash Ads for eBay.com on desktop computers. The red arrows point to ‘Days Seen’ figures that are greater than 30 days. Remember, the highest ‘Days Seen’, the more successful the ad most likely is. 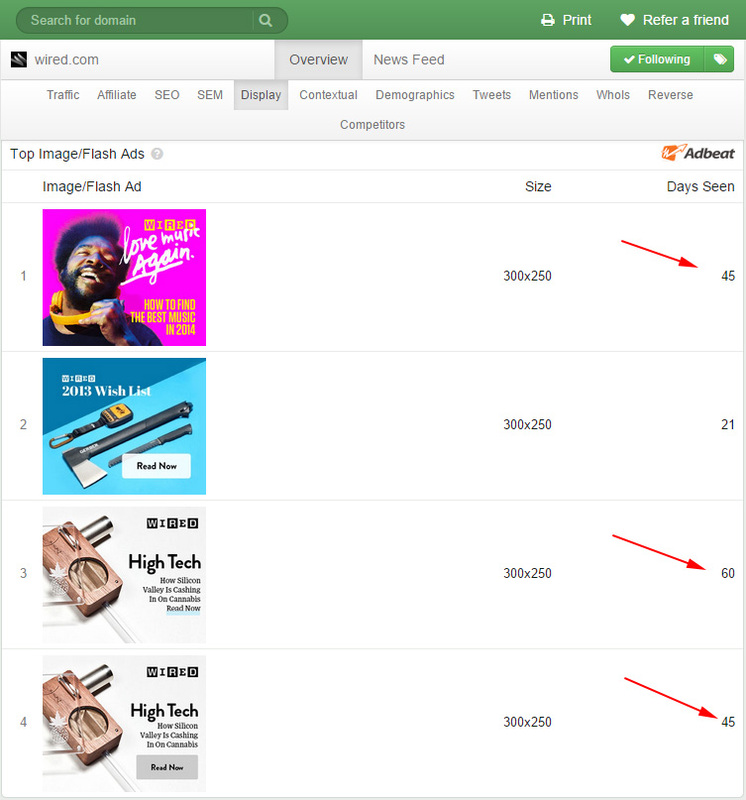 At this time, Amazon has been running only two ads on desktop for more than 30 days (under Top Image/Flash Ads), which are the 1st and the 4th from the previous image. Surprisingly, the 4th banner has been running for 404 days, as shown below. That’s more than a year. That must bring in, obviously, a lot of business leads. Let’s now take a closer look at this ad. The title is specific enough and immediately conveys the benefits (not features). The CTA is clear and descriptive. It does not say “Click Here,” but says “START YOUR FREE TRIAL.” The CTA is very clear on what it will happen when clicking, which is starting a free trial. Moreover, the CTA is catchy with its capital letters, and with blue color that stands against the orange background. The teaser includes the word “FREE” (also included in the CTA). The wording is very similar to the main CTA. Thus, this supporting element gives emphasis to the main CTA. The supporting message stresses once more on the benefits a person would have by signing up. The message definitely supports the main title, promote the value of the ad, and lead into the call to action. The logo is centered and very visible. The main purpose of the logo here is creating brand recognition and enhancing trust. Is the ad offer specific enough in the title? Yes. Does the ad mention a benefit? Yes. Does the ad mention a feature? No. Does the ad include a specific CTA (Call to Action), clear enough that makes a reader understand what happens after clicking? Yes. Does the ad include the company logo? Yes. Does the ad have a teaser, supporting message for emphasis? Yes. All display ads that eBay is using now are running since more than 30 days. However, let’s see how the long-lasting banner looks like. Let’s now take a closer look at how it is structured. In this case, the title is also the logo but supported by an extra element, which is the word “FASHION,” this last one immediately conveying the specific idea that the banner redirects to a fashion page of eBay, and not its homepage. The colorful letters against a white background put emphasis on the logo, creating brand recognition and enhancing trust. The copy is not that descriptive, but perhaps that is the main intention. However, the word “LESS” emphasizes a benefit: You can get fashionable clothes without spending a fortune. Women are always a good addition for marketing. The lady definitely stands out and attract the reader’s attention. The CTA is small, but definitely clear: Click on “Shop now” and you’ll be doing shopping in minutes. TIME and WIRED both work in the online media industry. Let’s see what they do with their banner ads. 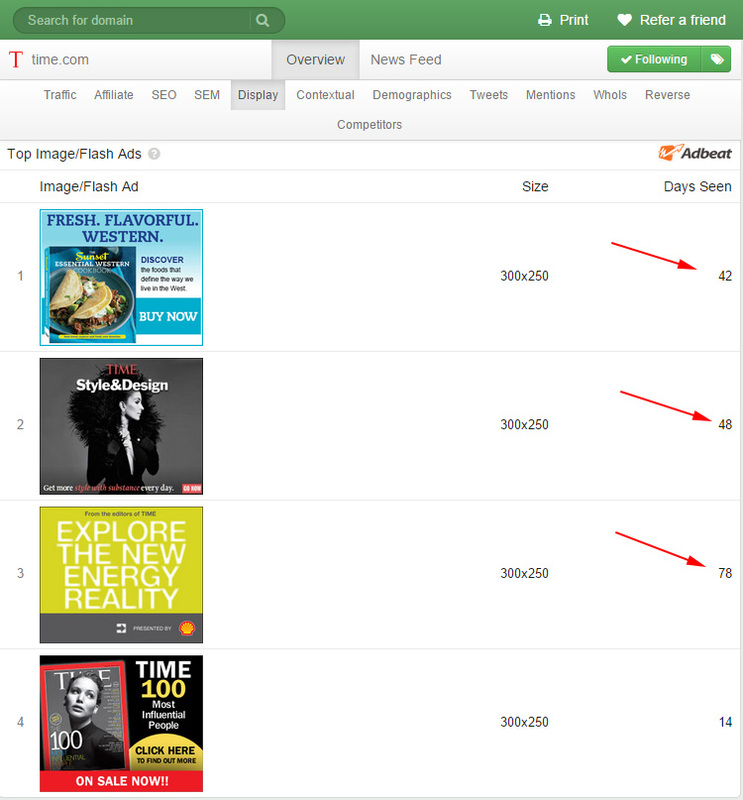 These below are the Top Image/Flash Ads for TIME (left) and for WIRED (right). Top Image/Flash Ads for TIME.com on desktop computers. The red arrows point to ‘Days Seen’ figures that are greater than 30 days. Remember, the highest ‘Days Seen’, the more successful the ad most likely is. Top Image/Flash Ads for WIRED.com on desktop computers. The red arrows point to ‘Days Seen’ figures that are greater than 30 days. Remember, the highest ‘Days Seen’, the more successful the ad most likely is. From the image above, we can see that TIME is running four banners (according to Adbeat data), three of which have been used for more than 30 days (see red arrows). This blow is the longest-running ad used by TIME. The title sounds as if whatever you’ll find when clicking, it will be good enough because written by the editors at TIME. Although that may holds true, the title is not specific at all, and does not convey any specific idea. The copy in the body is not that captivating. 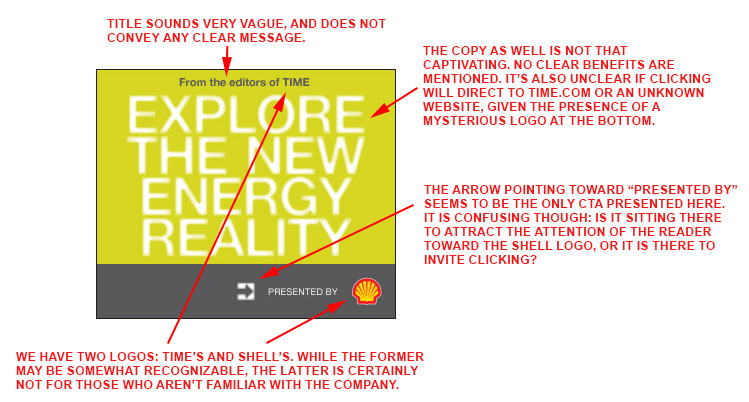 It’s not very clear what we are talking about here, and it’s unsure if, by clicking, a user would get redirected to TIME.com or somewhere else, given the presence of the shell logo at the bottom. The arrow pointing toward “PRESENTED BY” seems to be the only CTA presented here. The arrow is confusing though: Is it sitting there to attract the attention of the reader toward the shell logo, or to invite clicking? The banner has two logos: TIME’s (at the top) and Shell’s (at the bottom). For those who are not familiar with this entity, Shell is an Anglo-Dutch multinational oil and gas company. While TIME’s logo may be somewhat recognizable, Shell’s is not at all for those who do not know the Anglo-Dutch Corporation. Is the ad offer specific enough in the title? No. Does the ad mention a benefit? No. Does the ad have a teaser, supporting message for emphasis? No. Three out of four banners created by WIRED are running since more than 30 days (according to Adbeat data), as pointed by the red arrows in the image above. Let’s now take a look at the long-lasting banner ad. Let’s now analyze the ad in its elements. “High Tech,” the main headline or title, states a feature and not a benefit. The body of the copy, below the headline title, offers instead a big benefit: The reader will be informed about a current topic that may be of interest. The CTA is specific and clear enough. It’s easy to get the idea that when clicked, the banner will redirect to a specific article, page, or landing page regarding the topic, and not to a generic homepage. Although there is no supporting message, the ad has a supporting element, which is the image of a strange-looking object. This supports the whole message, and the element, indeed strange, definitely invites clicking to discover more. The logo is very visible, and, of course, enhances trust and brand recognition. Does the ad mention a feature? Yes. Red Bull and Coca Cola operate in the beverage industry. These below are the Top Image/Flash Ads for Red Bull (left) and for Coca Cola (right). Top Image/Flash Ads for RedBull.com on desktop computers. The red arrows point to ‘Days Seen’ figures that are greater than 30 days. Remember, the highest ‘Days Seen’, the more successful the ad most likely is. Top Image/Flash Ads for Coca-Cola.com on desktop computers. The red arrows point to ‘Days Seen’ figures that are greater than 30 days. Remember, the highest ‘Days Seen’, the more successful the ad most likely is. 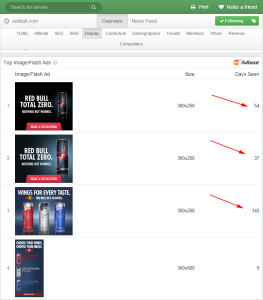 From the image above, we can see that Red Bull is running a few banners (according to Adbeat data), but one in particular, #3, is doing very well. 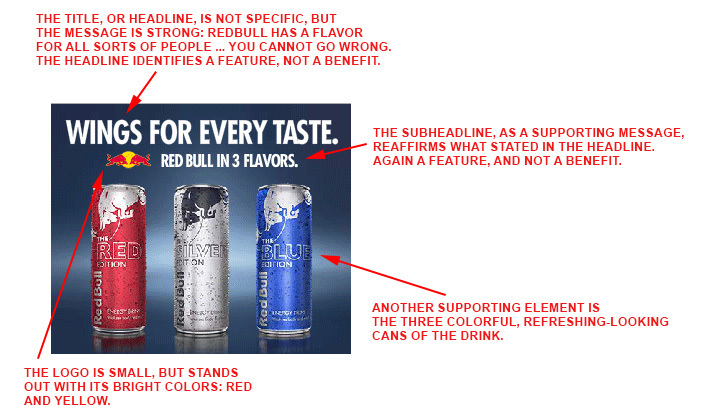 The title, or headline, is the opposite of being specific, but the message is strong: Red Bull has a flavor for all sorts of people. When you buy one, you cannot go wrong. The headline identifies a feature, not a benefit. The subheading, as a supporting message, reaffirms what stated in the headline. Again, a feature is highlighted here, and not a benefit. Another supporting element is represented by the three colorful, refreshing-looking cans of the drink. Although the logo may be small, it definitely stands out with its bright colors: Red and yellow. Moreover, the bull logo is also visible on the three cans. Does the ad include a specific CTA (Call to Action), clear enough that makes a reader understand what happens after clicking? No. From the image above, we can see that Coca Cola is running a few banners, as well, and #2 seems to be the most successful one. It has been running for roughly 250 days. The title blends specificity and dubiosity in its message. It is unclear why, together with Coca Cola, one can help students, but the ad somewhat makes you feel you want to know more. Perhaps Coca Cola is promoting something related to charity. The supporting image elements of the school, and the young school girl reaffirm the initial message in the title. Although the CTA may seem poor in its message — as we don’t really know what we are talking about here — perhaps “LEARN MORE” is indeed the right choice for the CTA. “LIVE POSITIVELY” is more like a slogan than a declaration of a benefit. It does not strengthen or weaken the whole banner. However, it sits close to the Coca-Cola logo, so it might serve (perhaps) as a hint that Coca Cola helps you live in a positive way?! The reference to the coke rewards make the whole affair even more confusing, but maybe one needs to click on “LEARN MORE” to discover what we are talking about. Audi and BMW operate in the car industry. 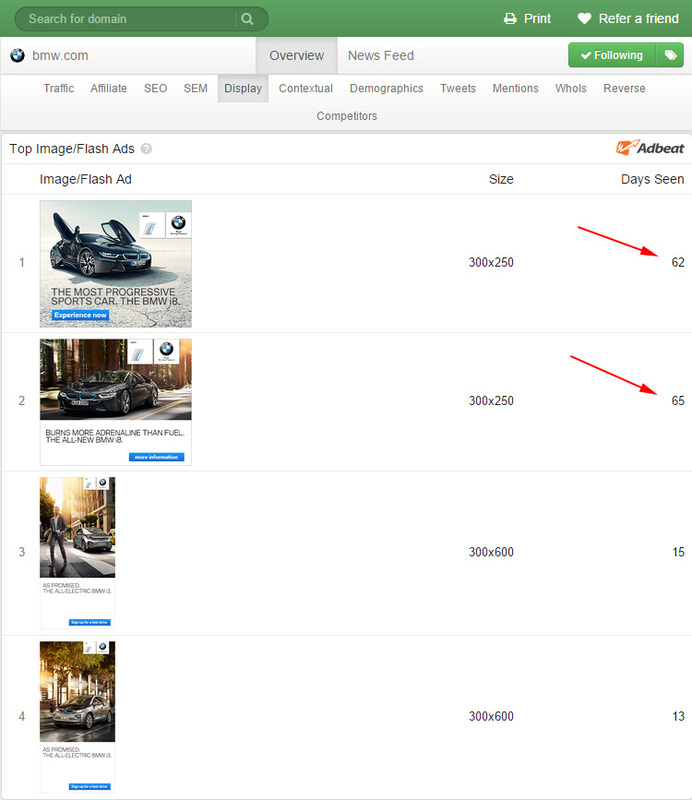 These below are the Top Image/Flash Ads for Audi (left) and for BMW (right). Top Image/Flash Ads for Audi.com on desktop computers. The red arrows point to ‘Days Seen’ figures that are greater than 30 days. Remember, the highest ‘Days Seen’, the more successful the ad most likely is. 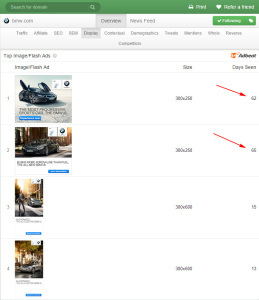 Top Image/Flash Ads for BMW.com on desktop computers. The red arrows point to ‘Days Seen’ figures that are greater than 30 days. Remember, the highest ‘Days Seen’, the more successful the ad most likely is. Audi has been running a few banners, and the longest-running one is #2. The title is highly specific, as identifies a specific product, the car model Audi A3. The message is definitely clear and laser-targeted. The supporting message is a great blend of benefits — identified by the words “high quality” — and features — identified by the words “high tech”. This message is, as well, absolutely clear and laser-targeted. The CTA is very specific: It’s clear where one will get when clicking, the red color helps visualization, and it’s quite obvious we are going to discover more about the car model. The logo stands out against a white background. Moreover, it’s supported by a small slogan, which may enhance even more trust and brand recognition. The image shows a preview of the product, and supports even further the message the whole advertisement is trying to deliver. BMW’s longest-running ad is #2, as shown below. The logo (right) is very visible, also supported by an extra element (left), enhancing trust and brand recognition. The car is the central element that grabs attention. It definitely prompts the reader to click to discover more. It also adds description, as it’s clear what we are looking at. The title conveys the benefit of driving a car that gives excitement, while not consuming too much fuel. Moreover, the title is also descriptive enough when mentioning that the car model is “all-new,” identifying a feature. We have seen a lot today. 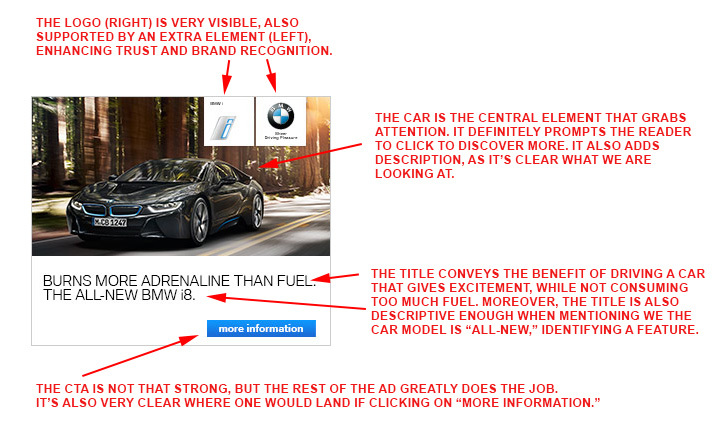 Many companies do a great job with their banner ads, but others don’t. There is no secret recipe to create a great, highly-converting banner ad, but by looking at as many examples as you can, may definitely help. What you should do now is read again this article, and see if you get any inspiration. You should perhaps make a list of 3-5 competitors of yours, and study their ad placements. See what their strong points are, but also observe their weaknesses. After that, it’s just a matter of building your own ads, and keep looking for inspiration to make them better. Follow can help with that, inspiration is just around the corner. Finding this kind of information in today’s world is no longer difficult, but you must know what to look at, and how to analyze things, to make informed decisions. Lastly, don’t forget to give Follow a try if you have not already. We also have a free plan to get you started. If you’d like to further discuss what we have just seen above, just leave a comment below, and we will get back to you as soon as possible. We reply to all comments. You way want to check the following similar articles if the above sounded interesting. This entry was posted in Competitive Intelligence Analysis and tagged ads, advertising, banner ads, benefit, brands, Click Through Rate, company logo, competitors, contextual advertising, CTR, text ads on October 22, 2014 by Davide Di Prossimo. Oh all right, I didn’t know you were involved in the Friday Reload. I like it. Yes, we are hoping to increase the content we publish here Sweeney.